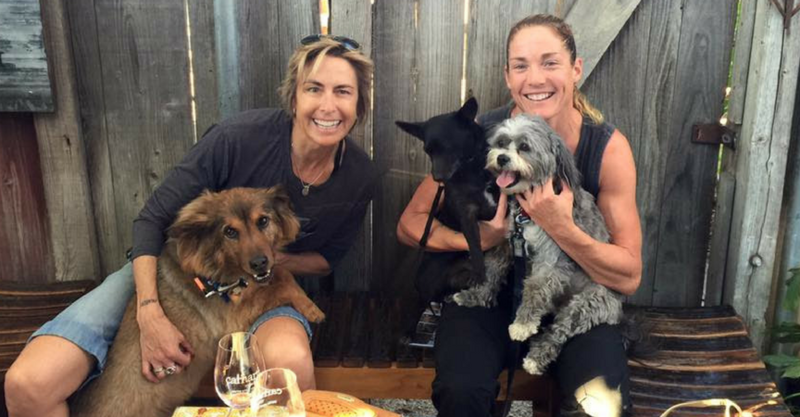 Siri Lindley and Rebekah (Bek) Keat are Rockstar Doggy Mommas! Siri is a world championship triathlon coach, high-performance life coach, and world class speaker. Her partner, Bek, is a former world champion triathlete. She’s also a winning triathlon coach and owner of the Team Sirius Tri Club. Both Siri and Bek are co-founders of Believe Ranch and Rescue, a non-profit horse and dog rescue. 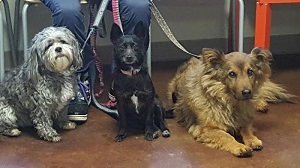 They are also moms to three rescue doggies: Bek, Calvin, and Sparky. As a young child, Siri was very fearful and insecure. Her rescue dogs were always her comfort. They were “the constant” in her life, she says. She could count on them being there, loving her no matter what. Since a young child, she has always said that her dogs rescued her. She learned her greatest life lessons from her dogs: How to find joy in the simple things in life; how gratitude changes everything; how love can change someone’s world; how to stand up and protect those you love, no matter what; and how to embrace all of who someone is. No judgment. Just unconditional love. What is the #1 thing you both love about being a doggy momma? The complete joy and love they bring into our lives. Their love is never ending. It fills our hearts and home with joy; our most cherished times are spent with them. On hikes, or walks, watching their pure joy and excitement over the opportunity to be outdoors, exploring everything and embracing the beauty of life! What do you do together to stay happy and healthy? 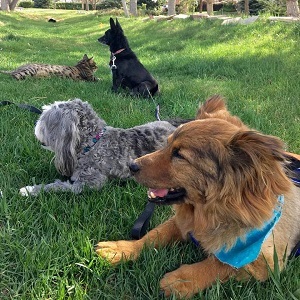 We exercise with our dogs, hike and walk. Sometimes they run with us, but they are all getting a bit older so we mostly just hike. And Sparky, the Chihuahua mix will follow us when we ride our rescue horses. He is absolutely tiny in comparison, but he walks along with such courage, so brave, and absolutely loves every minute of the great adventure! What is the most important lesson you’ve learned from being a doggy momma? Our greatest moments of peace, love, and joy can be found in the simplest of times. Love unconditionally and you get the most beautiful gift there is. What are your favorite health and/or pet products that you cannot live without? Greenies for their teeth, Salmon oil for their skin and coat, glucosamine, and chondroitin. We also love all the Bee Healthy Pet products. They are bee pollen and propolis infused natural, organic health and wellness solutions for our dogs. Great stuff! How do you make your home more doggy friendly? We have lots of doggy beds everywhere. Calvin needs his alone time, so he has a comfy crate in the corner that is always open, but available for him when he isn’t feeling social. We have water bowls in most rooms, and make sure we set up the beds near the windows so that they can relax while watching the rescue horses outside. We also have a fenced-in yard and a doggy door, so they can go out and do their business as needed. They can also chase the horses along the fence line as they often do, for fun! What is the #1 piece of advice you would give to someone who’s aspiring to be a doggy momma? Do it! It will change your lives in the most beautiful and powerful ways!! Don’t wait another day! You will be happier, healthier and will absolutely love the companionship of these amazing souls. Thank you to Siri and Bek – you are inspirational!